MQG Victoria: October Show and Share pictures! Kathleen was an awesome (and funny) speaker, but first we had our members' show and share! Natalie and HER KIDS made this for a soon to be niece/nephew and cousin. Mary made this polaroid quilt from blocks contributed by her satellite group. Netta knocked this long standing WIP off her to-do list. We think she knocked it out of the park. Read her blog post about it HERE. This is Judy F.'s fabulous quilt. The dark fabric is what she got in the ugly fabric swap at the July picnic. And the back of her quilt. Or the other front. Judy also made a little Hallowe'en wall quilt for her sister too. Ursula made this amaze-balls quilt using a charm pack she had picked up. If you look closely at the binding, it might look like a certain dog Ursula made a while back. A slightly better shot of more of the quilt. Why does Anne E look so chuffed? Her quilt was profiled in British quilt magazine! Go here for a much better look at the quilt. Kelly made this very cool woven ribbons quilt. Guest Gail made this four patch quilt with her siblings for another sibling on the occasion of a 60th birthday. Lois with another great quilt. Lisa W. made this runner from a row by row pattern we think? Lisa looking serious about her bag made at a Cloth Castle workshop. Lisa had this to say about this fabulous rainbow quilt: "it would have been a lot easier to buy the pattern first." Jillian made this terrific improv quilt for a new baby. A closer look at some of the great modern fabrics used. Janelle with a drunkard's path mini quilt. And the fancy fox got glasses AND quilted since last meeting! Faye showed her first quilt ever! Way to go Faye!! We're proud of you! And the awesome improv back. Nicole made this from old jeans and sashiko stitching in the tradition of "boro" quilting for an art show in Vancouver. 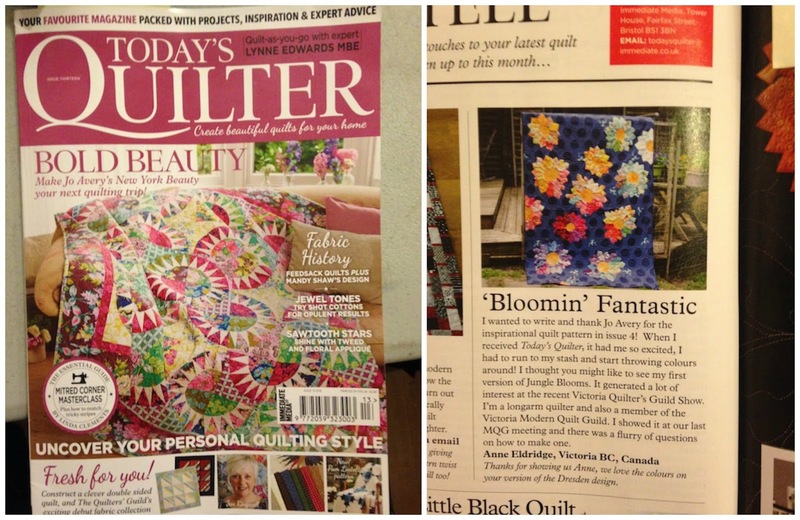 Pleased to report the quilt sold! Many thank to Netta for the jeans. Judy L made this casserole cover with her fabric from the ugly fabric swap challenge. Daria and the improv quilt which came out of the Cheryl Arkison workshops last year. And then it was time for our guest speaker, Kathleen Riggins of Kathleenquilts. We put ALL the pictures in their own album on Flickr, but here are a few highlights. There was a mad stampede to look at the quilts up close. New member Christine G. won this month's block lotto. And that was the October show and share!